My story of abuse and patent promises broken by the Patent Trial and Appeal Board (PTAB) usually falls on sympathetic ears. The fact that both Telebrands and the U.S. Patent and Trademark Office have teamed up to rob me of my patent rights is unjustifiable and outrageous. But I’m surviving. Even if the lawyers take 70 cents of every dollar I’ve earned, it leaves me with 30 cents. Not bad. But surviving inventors are incredibly rare. I have met dozens of inventors with incredible discoveries whose naïve belief in the patent system have cost them way more than they have gained. They taught a big corporation their technology either directly or via the publication of their patent. The big corporations have made tens of millions of dollars using the inventor’s technology. The inventor paid lawyers hundreds of thousands of dollars in exchange for losing his patent rights. Many of these inventors are financially and/or psychologically devastated, and every one of them has a legitimate invention. One such legitimate inventor who has been railroaded by the U.S. patent system is Tom Waugh. In the 1990s, Tom owned and ran a manufacturing company in Birmingham, AL, fabricating metal components for electrical distribution. This is the sort of hardware you see attached to utility poles. But Tom was an inventor at heart and he started thinking bigger. He decided to reinvent the utility pole. Existing poles were made of wood or expensive formed and welded steel. After a decade of relentless trial and error, he perfected centrifugally cast metal utility poles. The process is ingenious and mesmerizing. He teamed up with McWane, a plumbing pipe manufacturer which was also based in Birmingham, to commercialize his new technology. McWane was good at making cylindrical pipes. They did not know how to make tapered pipes/poles. Tapered poles are necessary so that they can be transported and assembled on site and to conserve material. Cylindrical cast poles had not been commercially feasible for McWane to sell. The reason that no one knew how to make tapered centrifugally cast poles was because the molten metal would collect in the fat end of the pole due to centripetal force. Like a ball swinging from the end of a string, the force caused the molten metal to flow outward and it then it would creep down the mold toward the end with the larger diameter. Tom struggled with this problem. His early prototypes had a wall thickness of less than 1/8-inch at the tip and 1/2-inch at the base. His eventual solution was to vary the rotational speed, infusion rate and other factors so that the metal would solidify in a perfectly uniform thickness along the entire length of the pole. His solution was a pole with a uniform thickness of 0.22-inch from tip to base. He had invented a commercially viable utility pole that was cheaper and stronger than those currently in use. In 2006 he applied for and was issued U.S. Patent No. 8567155, titled Centrifugally Cast Pole and Method. McWane was very interested in Tom’s technology. Tom, believing that his invention was protected by the issue of the ‘155 patent, helped them adapt their cylindrical pipe equipment to produce the tapered utility poles. This would open up a huge new market worth hundreds of millions of dollars for McWane. But in the end, they decided not to license Tom’s technology. They decided to copy Tom’s patented tech and take it for free. McWane went into production and built a successful utility pole business using Tom’s invention. Tom still had his business selling metal parts so he had enough money (he thought) to hire a lawyer to enforce his patent against McWane. In November 2013, he filed a complaint for patent infringement against McWane. McWane immediately filed a petition for Inter Partes Review (IPR) at the PTAB, and the district court case was put on hold. This took place in 2014, the year of the PTAB death squad. Tom’s lawyer panicked. Rather than face certain patent death, he shot his client in the foot. He applied for a reissue patent. Filing for a reissue means giving up all the past patent rights and several years of rights while the reissue patent is pending. It is an admission that the original patent was a mistake and it requires an inventor to start all over again to obtain another patent. His reissue moved relatively quickly and issued in January 2015. But the reissue patent was very narrow. It did not cover all centrifugally cast tapered pipes with uniform wall thickness. Instead it focused on a secondary problem that Tom solved, the use of a “running ring” around the tip of the pole to help roll it through the factory. I have seen this many times. The examiner and the attorney don’t know the law on obviousness or they don’t have confidence to properly apply it. They don’t appreciate that inventions are usually combinations of things that existed before. They think that the patent claim has to have something in it that has never existed before. Cylindrical pipes with uniform thickness existed. Tapered pipes with variable thickness existed. They don’t think it is good enough to invent a way to combine those. They want something more. So they added the “running ring” limitation to Tom’s invention. This is not how the law works. The law requires a motivation to combine those references as well elimination of hindsight by considering objective evidence, such as commercial success. Everything is obvious after we know about it through a patent disclosure! What I have found is that the U.S. Supreme Court’s 2007 decision in KSR International v. Teleflex created this mess and weak-willed lazy lawyers and examiners have perpetuated it. Rather than adding the almost irrelevant “running ring” limitation, Tom’s lawyer and the patent examiner should have fought for Tom’s right to his invention. Even if he wins with this new patent, McWane can design around the “running ring” limitation in a matter of weeks and there is nothing Tom can do about that. Meanwhile Tom keeps paying his bills, trusting the experts, and believing that somehow, someday, McWane is going to have to pay him for his invention. “It’s okay Tom, we got you a real good patent now. Could you top off your retainer?” Sure enough, McWane is practicing the ’329 reissue patent’s “running ring” and all. Tom goes back to court. McWane files another IPR. The district court case is stayed. The touted faster and cheaper PTAB is not working out for Tom and it doesn’t work out for any inventors. Tom’s lawyer explained to the PTAB how the “running ring” is different than a flange and so they shouldn’t cancel his patent. Again that is not the law on obviousness. It is perfectly legal and innovative to combine two things to make something new. The PTAB said the “running ring” is the same as a flange and flanges existed before so they issue a final written decision that Tom didn’t invent that either. Tom throws good money after bad and hires an appellate attorney to take his case to the Court of Appeals for the Federal Circuit. In a few weeks, he will attempt to persuade the Federal Circuit that a “running ring” is different than a flange. But there is one thing which is made very clear by Tom’s story: No one but Tom cares about his invention. No one will help him defend it effectively. If he keeps trying to play the patent game of kings, he will become a pauper – a much worse position for having acted on the false promise of the modern American patent system. Josh Malone quit his corporate job in 2006 to take his shot at the American (Inventor’s) Dream. Eight years later, savings depleted and orthodontics and college unfunded, he took one last swing before trudging back to the corporate world. And hit the homerun with Bunch O Balloons. His solution to the 63 year old problem of filling and tying water balloons instantly became the number one selling spring/summer toy. It was just as quickly knocked off resulting in a patent litigation now totaling 6 patents, 5 patent suits, 5 PTAB petitions/trials, 4 preliminary injunctions, and 8 appeals at the Federal Circuit. He is currently a Fellow with US Inventor working to restore the patent system. There are currently 54 Comments comments. Had such innovation been protected – and promoted – one may easily see that an advance on such innovation may come in the form of additive manufacturing. Far more intricate structures (i.e., bridges) have been built by additive manufacturing, and a tapered pole would be an easy item to so build. I am wondering why those clowns on “shark tank” still ask if new product is “protected” by patent or not ? Josh and Steve look a bit alike. I think that Alice allows any competent fact finder to invalidate any claim they don’t like. And if Patents were Strong like the Myth says with 20 Year Right to Produce, banks would led on them and we’d have a healthy economy. Instead we have Startups down by 50% in 2016, our Patent System now 12th Place, Knock-Offs and Infringement. Josh / Steve: I have a question for you. You said “The examiner and the attorney don’t know the law on obviousness or they don’t have confidence to properly apply it. They don’t appreciate that inventions are usually combinations of things that existed before. They think that the patent claim has to have something in it that has never existed before. … They don’t think it is good enough to invent a way to combine those [two pieces of prior art]. They want something more. So they added the ‘running ring’ limitation to Tom’s invention. This is not how the law works. The law requires a motivation to combine those references as well elimination of hindsight by considering objective evidence, such as commercial success. Because an examiner can pretty much create any subjective motivation in issuing an obviousness rejection (e.g. for the purposes of “making the thing more efficient or improving what the disclosure teaches”, etc — paraphrased, but this has been my experience), how can one argue against such a rejection using objective evidence to eliminate hindsight, as you say? Is there a guide or document or framework you can direct me to that I can follow if/when I receive an obviousness rejection to which I disagree? I have not read the patents, but I have to note that in pipe-fitting and connecting “flange” is so general that the PTAB may not have been completely without justification to find a “running ring” to be a flange. Centrifugal casting is old technology, and there is extensive literature. Before filing the complaint for infringement, Waugh needed to consult an historian of science and technology — preferably one that reads German fluently at an academic level. Centrifugal casting was invented by Krupp — something that is good and bad. It means that the literature is thorough and might disclose an earlier equivalent invention, but it also means that it might be possible to find explicit teaching away from Waugh’s invention. Waugh could have filed dependent narrowing claims without canceling the pre-AIA claims (MPEP 1402 Grounds for Filing [R-08.2017]). Then he could have argued later against intervening rights and against constitutionality of review for the old claims. In amending the original patent his patent practitioner should have prepared for a petition for institution by attempting to anticipate the arguments and by creating claim charts along with a prima facie case for patentability. The petitioner has the burden of proving unpatentability by preponderance of the evidence. At this point Waugh would have been prepared to file a complaint for infringement and to make a response to the petition for institution of review. Exactly when to make which arguments for patentability depends on the quality of the petition for institution. Consider this diagram from MPEP 2106. 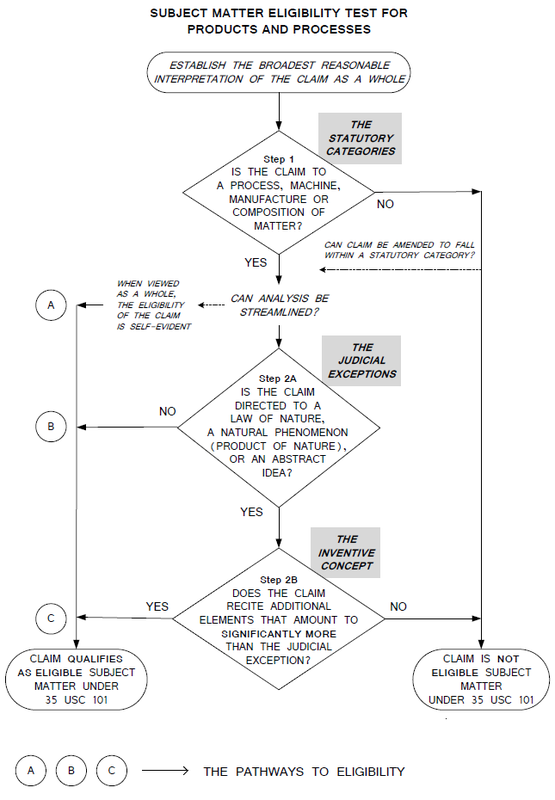 To which judicial exception are any of the claims in either the original reissue patents directed? Remember that the centrifugal force is a fictitious force and not a natural phenomenon. The entire “directed to” is nothing but an exercise in abrogated power that the Court no longer has (and has not had since Congress changes the law back in 1952). Part of the Act of 1952 was Congress stripping the power of the Court to use common law evolution in defining the term “invention,” “spirit of the invention,” gist of the invention” or any of a dozen or more similar terms. Part of the Act of 1952 was Congress directing exactly WHO gets to determine what the invention is (hint: 35 USC 112, and that person is NOT the courts). Joachim – there was no dispute that Tom’s invention was novel. The fact that he accomplished this in a field that is hundreds of years old should have helped him, not hurt him. He was indisputably the first to do it! It was not his burden to prove the negative as to why no one did it before him. No one else knew how to make tapered poles with uniform wall thickness. But “it would have been obvious” is the subjective opinion of the PTAB that destroyed his investment. Mike – you are asking about examination. This is not a problem. Your client is much better off for the PTO to be arbitrary and unreasonable before making a promise of exclusivity. There is no point is asking how to persuade an examiner to give you an allowance, because if he does it will be destroyed by his colleagues down the hall in the PTAB, at a cost of $500K to your client. Others will tell you to do a thorough prior art search and a rule 132 declaration. But none of that matters to the PTAB. The PTAB has discretion to ignore the work done by the examining corps and revoke your client’s patent. This is especially a problem in light of the Oil States dicta that post AIA applicants are fully informed and consent to PTAB revocation of their patent rights. They can always say “it would have been obvious” by crediting the infringer’s hired expert who said “it would have been obvious”. Why would your client want a patent like that? It is not ethical to take money from an inventor under these conditions or even to advise him to pay for an issue fee for a public franchise patent. Any inventor that consents to those terms for a patent could not possibly be of sound mind. So, given that, would you be kind enough to look at my questions again, both from a prosecution/examiner perspective, as well as from a re-examination perspective. A) How can one argue against an obviousness rejection using objective evidence to eliminate hindsight, as you say? B) Is there a guide or document or framework you can direct me to that I can follow if/when I receive an obviousness rejection to which I disagree? The courts consider that any patent issued since 2011 came with the condition that the PTAB can revoke it and that patentees are not entitled to a trial by jury. The PTAB cancels 85% of issued patents. So if we show you how to get an allowance from the examiner, it will not serve your client. The client will have a public franchise right, which requires millions of dollars and substantial political influence to maintain. Without that money and influence, the patent will not be backed by the full faith and credit of the United States government. Instead, if the invention is valuable, the U.S. government will cancel the patent so that a wealthy politically connected corporation can use the invention. It seems that rather than address my question, you continue on a premise regarding fear of the PTAB, particularly a tribunal to which was not in place as of my priority date when my initial disclosure was filed, and when I entered into the patent bargain with the Government. As evidence of this, my patents are being examined using pre-AIA rules. However, I AM the client. I’m a Pro inventor. Please do not assume otherwise, nor assume anything differently speaks less on the merits and claims I currently hold and continue to seek. That is, if you truly care about small inventors like me. I believe I am sitting on very valuable patents, and I’m continuing the development of my portfolio. Moreover, regarding “public franchise right”, per the SCOTUS opinion quoted above, it seems very clear that SCOTUS has distinguished that as far as these rights are concerned, pre-AIA patents have different rights than AIA patents. It is a fun exercise to read the Oil States opinion and focus on what Oil States is saying, and what they are NOT saying. Perhaps, if you genuinely care about small inventors, you could consider these facts and address my questions, that is, if you feel like you have an answer to them rather than seemingly dodge the question. Your patents are only valuable insofar as they can be monetized to command significant licensing revenues. Do they? If not, I think it’s time you faced certain realities, some of which Josh and Steve wrote about. IPR under AIA is not the only danger facing your patents in the current system. I too have a family of patents that may be of value (my sixth patent issues on Monday), all of which have a pre-AIA priority date. But I am inclined to think that they are worthless without millions of dollars in the bank to litigate them into full enforcement…and in addition to that the market for the technology needs to mature a bit. Apple may be making a splash and infringe within the next couple years. But then what? I send Apple a polite “cease and desist” letter and their army of attorneys has a good laugh and throws it in the trash. I’m sure you know this but a response to rejection needs to be specific to your invention and must address the combination of prior art referenced by the examiner in a way that gives the examiner some “wins” and gives you some “wins”. You can do this by focusing on your most valuable claims and trying to strengthen those. If you wrote your claims strategically, you anticipated what might be rejected and built in language that made it ok to withdraw claims that weren’t paramount while still getting the heart of the patent allowed by traversing the examiner’s arguments. Hope that helps. *Mike* – I think that Josh and Steve care about you as a “self made inventor”. Perhaps it is you who is not listening? TODAY’S REALITY IS IT DOES NOT MATTER IF THE PATENT IS PRE OR POST AIA. THE PTAB WILL INVALIDATE ANY PATENT THAT COMES IN CONFLICT WITH MORE POWERFUL CORP. INTERESTS [i.e. “EFFICIENT INFRINGERS”] PERIOD. I had nearly 30 PRE-AIA patents and the PTAB gutted the most significant two independent claims of #1 in order to “serve” the “financial services industry” (the guys who print the ,money). Multiply Tom Waugh’s COSTS from hundreds of thousands to > “TEN MILLION”, and the DAMAGES to many HUNDREDS OF MILLIONS, if not over a BILLION! But don’t let me dissuade you. You may prove all of us who have genuinely “BEEN THERE and DONE THAT” wrong. *Silicon Valley Inventor* Truth well spoken. Just wanted to add something to think about. In my case, as I said, I was going up against the financial services industry. So was a “tiny” company by the name of INTELLECTUAL VENTURES, Nathan Myhrvold’s (of Microsoft fame) patent holding company. They literally had BILLION$$$ of dollars and could afford the very best lawyers money could buy. And they, [“IV”], went down the EXACT same path to the EXACT same fate I did. You better bring way more money than your opponent is all I’m going to suggest. McWane immediately filed a petition for [IPR] at the PTAB, and … Tom’s lawyer panicked. Rather than face certain patent death, … He applied for a reissue patent. The examiner and the attorney don’t know the law on obviousness or they don’t have confidence to properly apply it. They don’t appreciate that inventions are usually combinations of things that existed before. … So they added the ‘running ring’ limitation to Tom’s invention. I ask this particular question because you didn’t particularly show how one can fight for one’s invention in your article, that is, how one can successfully use commercial success to eliminate hindsight that you suggest when receiving an obviousness challenge. I recall Apple trying to argue commercial success v. Samsung against obviousness and lost, so I’m looking for a guide or document or framework to follow if/when I receive an obviousness challenge to which I disagree. I’m certain one will come down the pike, and it’s best to be prepared. NO more money, no contact, no communication at all. Period. Although you didn’t answer my question(s), thank you for your advice. Yes. I wouldn’t have litigation firms asking to meet to discuss contingency options otherwise. The problem is that prosecution is up to me to build the portfolio, and when challenged, I need to be prepared there also. When you say “a response to rejection needs to be specific to your invention and must address the combination of prior art referenced by the examiner in a way that gives the examiner some ‘wins’ and gives you some ‘wins’,” sure, but this this is examinational. What about post allowance during litigation and/or in re-exam, when claims cannot be changed. At that point, one is pinned against the wall, and sure, you bring multiple patents in the action, but once pinned, how does one eliminate hindsight when arguing against obviousness? If it is commercial success, for example, commercial success of what? And how is that proven? This is the info I’d like to know in advance, because this actually affects my claim construction now because I can anticipate the arguments and draft claims around what will be argued and have evidence and data to support the claim language when it is picked apart later. So I’m looking for a guide or document or framework to follow to be prepared so I can shoot down obviousness challenges and even defeat them now with my continuation claims. IPRs are up to you too ? All zillions of them ? Dude, r u new to this patent “business” ? Or you have a rich aunty in Brazil ? Go home angry dude. Read above regarding preAIA status. You bring nothing productive to the conversation. I’ll at least put this here for your convenience, and then I have nothing more to say to you. Sorry you lost, but don’t crap on my dinner; your bitter infection is not contagious. Moreover, if I were to hold your pessimism, it would be without merit, specifically because: why would lawfirms, who know the risks, be holding contingency talks with me and put their own skin in the game unless they knew something was there. If you had read above, you would have seen this. But I digress. So, “to the morgue” with your illness. I will correct you no more nor respond because you, frankly, are wasting my time. But .. do you have a dollar to show which is coming from your patents ? Josh / Steve: Thanks for the links. ipwatchdog has some really bad delays on the posting of comments apparently, because yesterday, your reply was absent, but today, it’s there. I rescind my finding of disingenuity. Regarding your 37 CFR 1.132 declaration, you declare the commercial success of your product; however, considering that a patent is an exclusionary right (doesn’t grant you the right to produce, but to exclude others from doing so), should the argument on commercial success be geared toward the commercial success of other products prior to, and then after, practicing/implementing your patent? I’m genuinely curious here. Regarding the phrase “substantially filled with water” as mentioned here — http://www.ipwatchdog.com/2017/07/16/real-staggering-cost-getting-patent-tab/ — I do find this phrase ambiguous, that is, unless “substantially filled” is particularly defined in the specification. But I’m not for certain if I qualify as one of ordinary skill in the art. But anyway, are your applications preAIA? If not, I’m not certain if your perspective/experience on the PTAB/IPRs applies with respect to preAIA patents. I find it interesting, being that I did not enter into any patent bargain having any mention of PTAB/IPRs (an execute branch examinational proceeding), that the USPTO examines my patent applications under the preAIA statute, which lends support that these preAIA patents, once issued, should not fall under the PTAB, which the USPTO readily admits that the new IPR proceedings are examinational. Why would a preAIA patent be examined under preAIA and then also examined under “not preAIA”? That alone would rescue a large majority of small inventors and put a sting in the patent holocaust lobby, so how about some folks at IPWatchDog get behind that agenda? Do not be lulled by the Thomas dicta – note that the patent in the Oil States case itself was a PRE-AIA patent. If Thomas truly felt as his dicta indicated, he would have (could have/should have) sua sponte moved that into his holding in order to have justice prevail. Why would Thomas even bother writing that unless there was something there. In the Oil States oral arguments, the problem of the government creating a reliance interest upon patent grant was acknowledged, even by the majority opinion holders. The retroactive application of IPRs to preAIA patents really does run against constitutional protections of property. And no, being a “public franchise” does not exclude a patent from having the attributes of property property, as shown by Thomas’ comments. Also note that Thomas is not seven people; He’s not the only one who signed the opinion. In order to reach consensus of these seven justices, it is possible that a sua sponte move was withheld from the opinion, but in fact possible that some of the justices desired such a sua sponte. I’m certain that at least the minority would have been in favor of holding the retroactive application of inter partes review to pre-AIA patents as unconstitutional, and because this unnecessary language is included in the majority opinion, this indicates that at least one of the majority must have been in favor of such a challenge if brought by Oil States in order to sign the opinion. So we have at least three in favor. All we need is two more justices, and the retroactive application of IPRs toward preAIA patents would be held unconstitutional. A big win for inventors and a bite against the patent holocaust / efficient infringer lobby. How about someone push this agenda rather than throw in the towel, as everyone seems to be doing here in defeat. Now, failing that such a move on the judicial side, Iancu alone holds the discretion whether to institute an IPR. If Iancu supports inventors, he should see the flaw in pre-AIA patents being subject to AIA examinational procedures, such as IPR, and deny all IPR petitions for pre-AIA patents. That would also be a positive move by the Iancu, and because he holds the discretion to do this, this one cannot be challenged. I reply: GIVEN that this WAS a pre-AIA patent, why would Thomas NOT bother taking his offered “dicta” and apply it (as a holding) to reach a just result? The Supreme Court is NOT limited (as we have often seen) to what is asked of it by the parties – heck, just look at Alice. Your “answer” of “the party got greedy” is not availing. The only answer is that the dicta by Thomas has ZERO force. It’s easy to throw out things with zero force – some bread to go along with the circus. Because the Office concedes to examining preAIA patent applications using the preAIA examinational statutes (and examines AIA applications using AIA examinational statues), will you commit to denying IPRs for preAIA patents given that instituting an IPR on a preAIA patent raises a constitutional issue of due process and takings, especially considering that no preAIA patent applicants agreed to the patent bargain of being additionally examined under the AIA/PTAB/IPR post-grant? Continuing to examine preAIA patents both under preAIA and AIA post-grant does seem to raise an issue of trust, does it not? And note that Oil States did not say that denying IPRs for preAIA patents is unconstitutional. And you alone as the Director acting on behalf of the Executive Branch have the discretion whether or not to institute an IPR, and your decision is final. Only instituting IPRs for AIA patents and not for preAIA patents would go a long way in support of inventors trusting the system and trusting the Office to follow the constitutionality of the statute, especially when a reliance interest is created by the Office upon patent grant, and you have mentioned repeatedly in your speeches of your desire to “increase the reliability of the patent grant”. Would you be open to considering this? >> why would Thomas NOT bother taking his offered “dicta” and apply it (as a holding) to reach a just result? Because he would need consensus to do so, and he didn’t have it. Possibly because it wasn’t argued and therefore not fully adjudicated to reach consensus. But it was mentioned. I agree Thomas has zero force, and that’s a good thing, given he was in the majority in Oil States. So lets discard who wrote it, and focus on what it says. There was at least one opinion who desired including that language in the ruling, otherwise it wouldn’t have been there, and seven signed their name to it. Only 3 of those seven (all of whom signed) would need to join the minority in ruling retroactive application of IPRs to preAIA patents as unconstitutional. And with that, we would then take back that second chance of biting the apple for the patent holocaust lobby / efficient infringer lobby for a large number of inventors out there. Gene, if you are reading this, please read my comment above regarding one thing that I would like to have been asked (or possibly be asked in the future) when with Director Iancu. If only we had known of your pending interview, and we could have submitted questions for you to consider. In other words (I am paraphrasing your answer – so please correct me if I do so incorrectly), Thomas did NOT move his dicta into holding, even though the patents in suit were PRE-AIA because such was not possible to arrive at a holding that would stick. For those that would hold our Supreme Court blameless – here too is another decision of theirs that deserves the highest level of rebuke and disdain. There is NO “careful” here. There is plenty of one branch exceeding its Constitutional authority to rewrite patent law in an image of its own desired Ends. MIKE (& Angry Dude)… Why did God give us one tongue and two ears? So you could HEAR twice as much as you SPEAK? It means just that; you should LISTEN more than you should SPEAK. With all due respect, why don’t you tell us a little more about your “portfolio” and your experience with it? You talk about patents’ (plural) – how many do you have/ plan to have and when? How much MONEY have you made via sales, licensing or sub-licensing them? How much MONEY have you spent on patent attorneys so far for ___ patents? I could go on but, apparently no matter how many people who’ve BEEN THERE and DONE THAT try to reason with you, you’re going to be the EXCEPTION! Have you actually read any of Gene’s columns? You are DEMANDING an answer that doesn’t exist Mike: Why don’t you HIRE Gene? Why don’t these ‘contingency’ law firms beating your door down provide you the advice you seek? You have as much chance of finding answers to your questions as finding the Holy Grail. It doesn’t matter what the law says; if they need to change it to win they will. On the fly as they are going along on a whim and not think twice about looking back. It won’t matter how much money you have, you can’t outspend the government. It doesn’t matter your patents are pre-AIA. AIA sentiment rules apply now period. I got my first patent in 1984 (fitting lol). Got an injunction when the inevitable copy appeared. Think that happens now? It’s the rarest exception today; not the rule. I am the last person you would ever call pessimistic or lacking perseverance. I can say that being in a fight against insurmountable odds of money and power. The ONLY way I’ll win is if almighty GOD performs a 21st Century MIRACLE. You should THANK “Angry Dude”. His is a RIGHTEOUS ANGER. We played the game and the rules changed while the game was still going on. An guess what? They’re STILL CHANGING. Every SCOTUS decision only makes them “Fifty Shades of Grey[er]”! I’m out of the patent game now – all mine expired May 2017. I WOULDN’T INVEST A NICKEL INTO THE MATCH TO BURN A PATENT NOW. Do yourself a favor. Invest $4.99 and watch the movie “NEWMAN”. Regardless of what you think of his invention, the tale of his life will be like ‘prophecy’ for you. Ask yourself…is this what I want to do for THE REST OF MY LIFE? if you aren’t ready for that kind of fight, you’re in the wrong business. If you are, keep fighting. After 15 years “fighting” I made over $3 million in about 6 months “sub-licensing”. So, my bona fides are pretty good. If you want to know what happens AFTER you start to make money “monetizing your patents”, stay tuned to IPWatchdog! Sorry for your pain David. >> I WOULDN’T INVEST A NICKEL INTO THE MATCH TO BURN A PATENT NOW. >> Have you actually read any of Gene’s columns? You are DEMANDING an answer that doesn’t exist Mike: Why don’t you HIRE Gene? You are welcome to argue the author in the comments there. Perhaps you might ask the author to also hire Gene too, since he is seeking the same answers? No, you’re right, that would be stupid to suggest such a thing. >> With all due respect, why don’t you tell us a little more about your “portfolio” and your experience with it? Nice try, “Mr. Cuban”. Pray tell me how my particular portfolio has anything to do with the unconstitutionality of retroactive application of preAIA patents, save the one sole fact that it is preAIA. To conclude, he who risks nothing, gains nothing. I’ve at least got the balls to play the game and not throw in the towel yet. All inventors should be investigating and seeking victories for each other. Am I naive? Some might say yes, but only those who are sitting on the sidelines. And the 4th quarter hasn’t started yet. So where are all the inventors? Did they leave the stands and stop cheering? I might not be wearing a ring when the game is over, but I can guarantee with 100% certainty — neither will the ones who gave up. “I believe I am sitting on very valuable patents, and I’m continuing the development of my portfolio”. “INVENTORS WITH BALLS” don’t hide behind an ALIAS. And “YOUR VALUABLE PATENTS” versus the MATCH? THE MATCH WINS! I’d trade insults with you, but that would just ruin your amateur standing. Without commenting on the substance of your posts, please take note that the “I use my real name” canard has no place here. Using a real name neither necessarily adds or subtracts anything. I have posted consistently, and have championed anonymous and pseudonymous posting as such have a long and valued history for the US sovereign. There is zero need to engage in such “outing” techniques and you only dilute your message with such attempts. I suggest that you resist the urge and instead focus on the content. Unless I missed it, you are missing the largest obstacle to your own argument regarding Oil States. Thomas’s dicta states: “even though that procedure was not in place when its patent issued”, when its patents ISSUED. Your prior date or your application date means nothing. Your patent, if it were to issue, is going to have the language regarding the statute “at the time of issue” because it issued POST-AIA. If anybody has a clue as to when that battle will first be fought at the CAFC I’d love to hear about it. I know Letters of Additional Authority have been filed in some already briefed appeals, but I would love to know who will be up first to argue in front of the second highest bunch of screw ups in the land. Anon 37* I don’t believe you are the arbiter of what the rules are in this forum, but by all means if you feel the need to remain anonymous, please feel free to do so. Thanks for your comments Anon. Yes, show me where in the law a name of a party in a civil action carries more weight than the merits of the action, and we can all then share names and titles and such and happily participate argumentum ad verecundiam. >> “INVENTORS WITH BALLS” don’t hide behind an ALIAS. Right. Shrewd inventors do, until go time. If you read above, you’ll see I’m still developing. If you are actually sitting on any patents, your name is already public. Mike #35 QUOTE So where are all the inventors? Mike [END] It’s a shame but you don’t seem to know who your friends really are. Were you to read what I actually wrote to you, it was not to dissuade you from pursuing what I’m sure you believe to be both important and valuable. They were words of caution written to someone who by their own admission may be “naive”. Thanks for your help. I found your request for identity disclosure as fallacious. That’s all. Moreover, the people you mention have already pulled their triggers; hence, they are public by choice and each in their own time. This says nothing to my merits and patience to develop a strategy given the possibilities in my current landscape. Even John Hancock didn’t sign his name until the Declaration of Independence was in final form and they were prepared for battle. I’m sure there was plenty of private meetings and strategy beforehand, lest he be murdered in his own home. But when you do sign, sign it for the world to see. Absolutely. On what basis are preAIA patents examined by the Office under the preAIA statute and not examined under AIA rules? Other than by statute, is there a particular constitutional reason for this? Perhaps this might be a start. Mathews v Eldridge, as discussed here? The game is not over yet. Where in my post do I mention “rules of this forum”…? Maybe you should read my post again, Mr. Barcelou. Mike, I like your spirit. And there is plenty of work to be done. Just not in the judicial branch. Ebay, KSR, Alice, Oil States, Vringo (cert denied), and dozens of Rule 36 PTAB affirmances destroying those inventors’ life work, prove that the judicial branch is not likely to give us back reliable patent rights. Fighting to obtain a patent puts you in a weird place. Paul Morinville got his first rejection about 14 years ago and just last week filed his appeal of the 101/Alice rejection. https://www.scribd.com/document/379533037/In-Re-Morinville-18-1895. These sorts of efforts are valiant, but not something any prudent inventor would initiate in this current legal climate. Plus you have to look ahead a decade to guess what new interpretations of the 1952 Patent Act will be created by the courts and the infringer lobby. A few weeks ago Google attorneys argued that filing a terminal disclaimer (a common procedural tool used in most patent applications) means that all patent claims in a patent family are identical so if one falls, they all fall. Fortunately the Fed Circuit did not buy it, but next time who knows. The Google law professors are now at work putting out papers and conferences advocating for the elimination of continuation applications, so that if they kill your first patent in an IPR you cannot remedy the alleged defect. There is a constant barrage of attacks to undermine the reliability of patent rights. Director Iancu, God bless him, can do very little from his position which only lasts for another 3 years anyway. Oil States was our last hope for help from the judiciary, and it was decisive. A pre-AIA grandfather exemption will be tested (and obliterated) well before your patents are devoured by the PTAB. A 5th amendment due process challenge will eventually get to the Supreme Court, and perhaps some tweaks will be required of the procedures. What will not happen under our current patent statutes, is for an inventor to secure an exclusive right to his invention by disclosing it to the USPTO. What inventors must do is put all of our research on hold and keep those inventions secret for now. And get 10,000 other inventors to demand that Congress repeal the AIA and overturn Ebay, KSR, and Alice. Then you will have a reason to negotiate with the examiner on the scope of your invention. Dudes, r u joking ??? Thanks for posting a link to Paul’s Appeal Brief to the Fed. Cir. Due to the pro se nature of his arguments he is almost sure to lose. Even if he had a team of the best attorneys helping him it would probably have still been a good but futile fight. If anything, we know that CAFC judges don’t like feeling stupid. They like to watch TV cartoons. So they could understand the McRO lip sync invention. They were quite proud of themselves when they understood the new database schema in Enfish. But object oriented inheritance for organizational charts? That may be pushing the bar a bit too much. Rule number 1: don’t make the judge(s) feel stupid. Keep the level of your inventions below the limbo dance bar. Sure, you can like my spirit, but spirit doesn’t beat facts. And the fact here is that you are encouraging people like me to throw in the towl in areas that need no such admission of defeat, while also not seeing opportunity for inventors to (re)gain much-needed rights. >> there is plenty of work to be done. Just not in the judicial branch. Why not the judicial branch? You admit that “A pre-AIA grandfather exemption will be tested”. You assume that it will be “obliterated”, yet you provide no evidence in meritorious support of such obliteration. >> Paul Morinville got his first rejection about 14 years ago and just last week filed his appeal of the 101/Alice rejection. … These sorts of efforts are valiant, but not something any prudent inventor would initiate in this current legal climate. And this is pertinent to my case how? Because you know not of my merits, this analogy is not pertinent. Moreover, receiving a 101/Alice rejection from a disclosure written a decade prior to Alice seems natural — it was written prior to Alice and thus, if it claims abstract subject matter, it very well might not be eligible. However, today, unlike a patent disclosure from over a decade ago, overcoming 101/Alice rejections should be part of all patent applications’ claim drafting process from the start. So honestly I fail to see why you bring this up. >> … Google attorneys argued [in the Federal Circuit court] … filing a terminal disclaimer … means that all patent claims in a patent family are identical …. [T]he Fed Circuit did not buy it, but next time who knows. …Google law professors are … putting out [information] advocating for the elimination of continuation applications…. There is a constant barrage of attacks to undermine the reliability of patent rights. If any of this barrage of attacks lands in the courts, amici briefs, etc., which you admit it does, then this means there DEFINITELY is work to be done in the judicial branch. >> Oil States was our last hope for help from the judiciary …. A 5th amendment due process challenge will eventually get to the Supreme Court, and perhaps some tweaks will be required of the procedures. I recommend minding the use of such absolute language. Does your “our” include preAIA patent holders, or is it only for those AIA patents to which Oil States says IPRs are constitutional? Because if your “our” does include preAIA holders, then Oil States is NOT the “last hope”. You even admit that “perhaps some tweaks will be required of the procedures” when “A 5th amendment due process challenge will eventually get to the Supreme Court”. The battle continues on all three fronts. I. There is still a fight remaining in the judicial branch, as shown above. II. Congress: Yes, repeal the AIA/IPR “experiment”. This proceeding does nothing to promote the progress of useful arts by securing for limited times to inventors the exclusive right to their respective discoveries, because the fact that the Office is able to rescind a grant after a patent has issued does not SECURE exclusive rights to inventors; rather, it creates a false sense of security (and without an Article III court, an unfair fight). And false security is even worse than no security at all — it actually DEMOTES the progress of useful arts. Just follow the investments to China. III. Executive: I don’t know if Iancu, as director, realizes this or not, but he has FINAL DISCRETION whether or not to institute an IPR. He alone can and should use the power of the executive branch to at least deny IPRs for preAIA patents, and the basis for this is a) not only the fact that the USPTO currently examines preAIA patents using preAIA examinational statues, but b) taking patents away from preAIA patent holders once the reliance interest has been created by the patent grant, especially considering that no preAIA patent applicants agreed to the patent bargain of being additionally examined under the AIA/PTAB/IPR post-grant, directly runs up against constitutionality. And Iancu’s discretion is final, per statute. Just like SCOTUS uses their constitutional right to interpret law without needing any special “statute giving them the ability to interpret”, Iancu shouldn’t need to wait for a statute or a SCOTUS ruling in order to enforce his constitutional executive powers as director. Stop the buck and begin denying IPR requests until Congress fixes it. The Courts can handle patent eligibility determinations post-grant and have done so for decades. on which planet do you live ? Apparently the one on which Iancu lives. You are welcome to come visit. I will educate you no more, angry dude. You are communicating with patent owners who has walked your walk, a long time ago, and have faced extreme unfairness in the field of battle. I’m on my 13th IPR petition.. Trust me, not only will the pit of your stomach drop and the anxiety of sitting for 6 months waiting to see if your precious hard fought patents gets instituted, wait for the feeling of the hole in your chest when you get the Institution decision and the bill for the cost to start a trial. Or the bad decision you get because the defendant has sentimental value to the judge (trust me, it happened to me). If it’s only 1 company that “might” ever infringe a patent you own, understand that’s a 2% club of patent owners, and with only 1 company to go after, you’re going to need at least $2mln. But your stance and glee on patents here in these comments in the face of verified veterans of the AIA war, is 10 years outdated. If you didn’t get in with the generation of patentees like Josh etc (I’m in that generation) you stand in a patent desert. Many of us were able to secure working capital through settlements, even that capability as of today is DEAD!!! Your patents will be worthless and nothing more than a souvenir.. with only a 2% chance you can even play the litigation game.. 0.02% of actually winning.